Microsoft clearly doesn’t believe in humanity. They’ve been stripping away my ability to customize the Windows experience for years, but they crossed the line with IE7. They’ve moved some stuff around; important stuff; stuff like the main toolbar. Why? Well, they would certainly allow me to customize it to my needs right? Wrong! For whatever reason (if anyone for the IE team reads this, please, oh pretty please, either put it back to normal or let me move ALL the toolbars around) you cannot move the top two bars. This means that every time you go for the file menu, you’ll probably hit the back button. Arrrg! Microsoft has generally respected user’s preference not to relearn the interface each time they upgrade, so let’s hope this gets fixed. Wrong position and no way to fix it, thank you IE7 Just don't ask, it's a bitter topic. 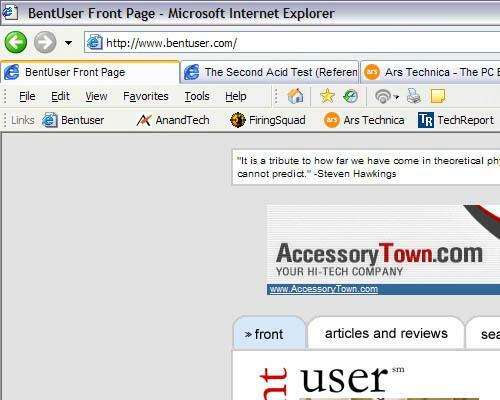 Firefox 1.5 continues the fine tradition of letting the user have some input. Not only does it support themes [themes are limited to icon sets, ed.] (do the people at Microsoft remember this concept? ), but you can also fully customize your toolbars. Want to move the search box around? Add or subtract some buttons? Go for it, you have the power. This is another hard feature to quantify. Both browser teams claim that they’ve improved this feature, but neither is perfect (actually an assumption, in a couple days with Firefox 1.5 I haven’t managed to get a pop-up). Dilbert.com has an annoying pop-up (Yes gdi, I think I’m smart!) that get past IE7 every time. Firefox manages to squash this one and, amazingly, seems to finally kill the pop-under from macdailynews.com that afflicted the last version of Firefox.